HIGHLANDS — (March 24, 2017) - The Henry Hudson Regional School SkillsUSA Community Service Team has just finished up their yearly project. SkillsUSA is a nationwide high school organization that trains students to become future leaders and workforce of America. In the past, this team has worked with 180 Turning Lives Around by holding a book drive to build a small library for children affected by domestic abuse. This year, the team had partnered with Parker Family Health Center in Red Bank. Their organization provides free health care for those who do not qualify for Medicaid but cannot afford a regular health insurance plan. Parker is not funded by the government, so they are in constant need of donations. 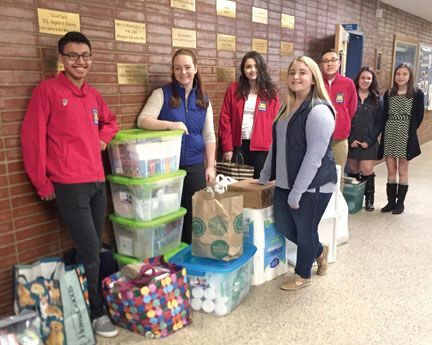 The SkillsUSA team held a donation drive at Henry Hudson Regional School and Atlantic Highlands Elementary School. They also enlisted the help of the Henry Hudson Tri-District Education Foundation and the Genevieve Hawley Foundation. The drive collected over 1,000 items for Parker Family Health Center. Many of the products are basic health necessities that some people cannot afford. These items, like toothbrushes and thermometers, will be handed out free of charge at Parker. Parker’s staff was incredibly grateful for the student’s work. Jason Gonzalez (from left), Shannon Forbes, Niamh Sherlock, Genevieve Keelen, Jack Sanders, Holly Diovisalvi and Charlotte Bigotto are members of the Henry Hudson Regional School SkillsUSA Community Service Team and just finished up their annual project.